Preheat the oven to 180°C, gas mark 4. Butter two 28cm x 18cm swiss roll trays and line with baking paper. Melt the butter in a large pan over a low heat, then add the sugar, syrup and peanut butter and stir over the heat until smooth. Add the oats and seeds and mix well. Spread in the tins and bake for 20 minutes. Leave to cool for 15 minutes in the tins. 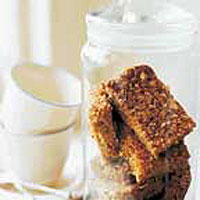 Mark the flapjack into bars, then turn them out of the tins when cool. Store in an airtight tin.